Skip the coffee shops, and make your own gluten free Pumpkin Cream Cheese Muffins at home. They taste much better, and cost a whole lot less. When I was diagnosed with celiac disease nearly 10 years ago, I don’t remember there being the huge food trends that there are today. I don’t remember hearing about people spiralizing their vegetables or eating smoothies that look like works of art out of a bowl. And as big as it is today, I don’t remember there being the big “pumpkin everything” phase during the whole month of October (although it’s starting earlier every year, it seems). Since the “pumpkin everything” phase only started after my diagnosis, I never had a chance to try Starbucks pumpkin cream cheese muffin. I’ve been told that these are quite similar to the coffee shop muffins by those that have dished out $4+ per muffin though. I’ll take their word for it. Here’s me, it’s not the month of “pumpkin everything’, and I’m posting a pumpkin recipe. There are a few reasons for that. Firstly, I think pumpkin can be baked with all year round, not just in fall. I baked a few pumpkins that my Mom grew in her garden this past fall, and made them into homemade pumpkin puree. If you’ve never made your own pumpkin puree before, it is really easy to do, and the taste, colour and texture are way better than anything that comes from a can. So now my freezer is full of packages of frozen pumpkin puree. What am I supposed to do, wait until October to bake with it again? Nope. 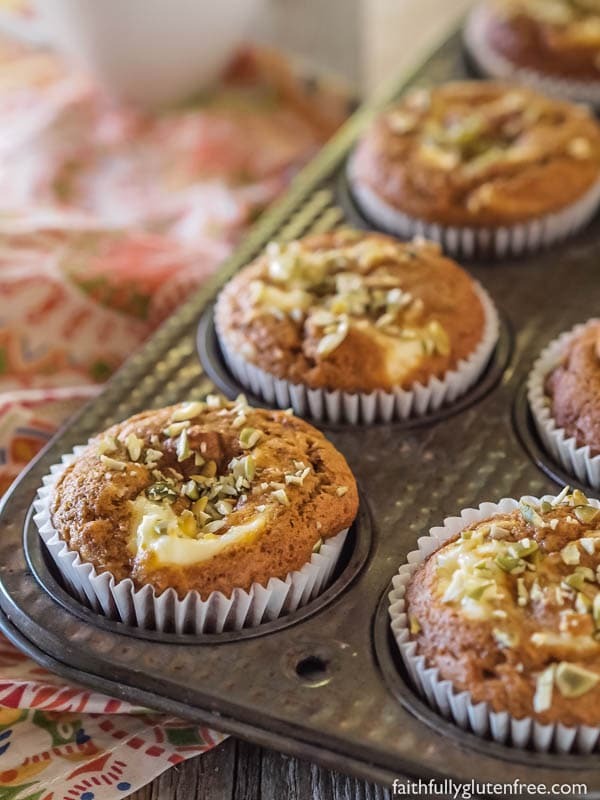 I’m using it all winter, because these spicy gluten free Pumpkin Cream Cheese Muffins are perfect with a cup of tea or coffee all year long. The second reason I’m posting this recipe in January, which is not the month of “everything pumpkin”? Procrastination. I did developed this recipe in fall – have made it numerous times myself – and simply never got around to sharing it with you. So, better late than never, right? Do you forgive me for keeping this awesome recipe to myself for a little too long? I sure hope so. If not, bake them, and after tasting one, please reconsider. Some of you may be wondering – don’t you already have a recipe for these muffins? I do. Or rather, did. I’m pulling that recipe, and replacing it with this one, because I’ve made some tweaks to it that make them so much better. The mix of flours and the amount of spices is just perfect on this recipe. 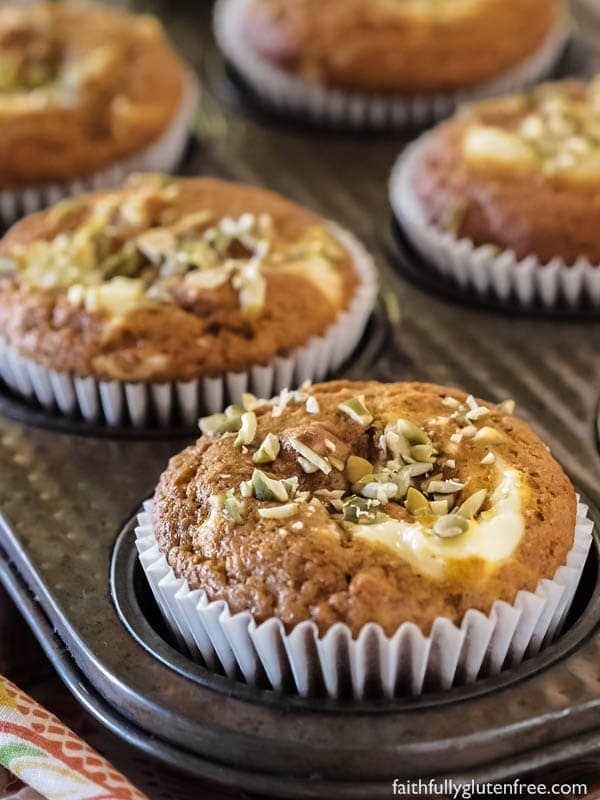 Adding a little something special to the top, like chopped pepitas, which are shelled pumpkin seeds, or chopped pecans is a great way to add a little crunch to these muffins. I’ve learned that if you warm up the cream cheese slightly before adding it to the batter, it makes it really easy to swirl into the batter, making the most beautiful muffins. I know some of you are going to ask if you can use an “all purpose” gluten free flour blend. Like always, you’re welcome to try, but I’ve only made the recipe as written, using individual flours. 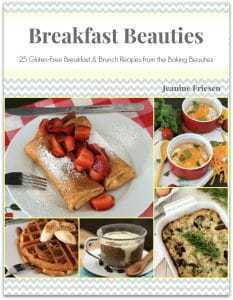 I’ve written about why I don’t use an all-purpose flour blend, feel free to read about it and give me your thoughts. 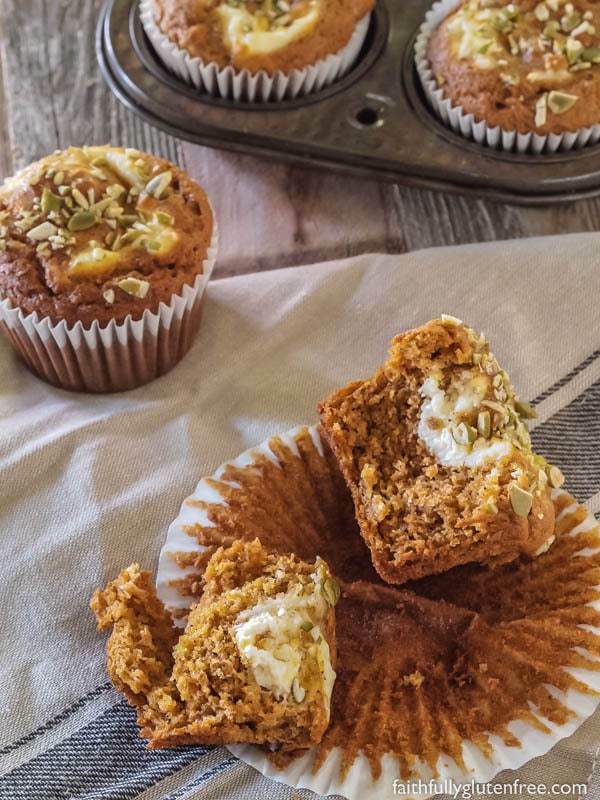 Spicy pumpkin muffins swirled with a slightly sweetened cream cheese filling. Preheat oven to 350 degrees F. Line muffin tins with paper cups or lightly grease them. In a small bowl, mix together the softened cream cheese and 2 Tablespoons granulated sugar. Set aside. In a large mixing bowl, whisk together the brown rice flour, sorghum flour, tapioca starch, cinnamon, baking soda, xanthan gum, ginger, nutmeg, salt, and cloves. In a separate bowl, whisk the eggs, brown sugar, granulated sugar, pumpkin puree, oil, apple sauce, and vanilla extract. Scoop batter evenly into the prepared muffin tins. Divide the cream cheese evenly between the muffins, about a rounded teaspoon per muffin. If your cream cheese is soft enough, you can use a toothpick or sharp knife to gently swirl it into the pumpkin batter. Top with chopped nuts or pepitas if you are using them. Bake the muffins in the preheated oven for 20-25 minutes, or until a toothpick inserted into the muffin comes out clean. Let the muffins cool in the pan for 5 minutes before removing them to a wire cooling rack to cool completely. Store them in a container in the fridge or on the counter. I find leaving one corner of the container open helps them to not get sticky by the second and third day, like pumpkin baked goods can do. You can also freeze them, taking out only what you need. Thanks! Hope you get a chance to try them, one of my favourite muffins. 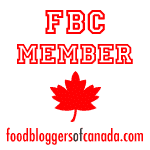 Could I use a commerical gluten free flour (Robin Hood or Bob’s Red Mill)…and if so how much? These look sooo yummy! But I’ll have to make some substitutions, since both my daughter and I are no longer eating rice or using rice flour. She is pretty much on a paleo diet, which has helped her psoriasis, so I often just go along with her diet when we bake. I’ll let you know how they turn out. We love pumpkin year round, too, and so does her service dog. We just give him a blob in his bowl! They look delicious Jeanine! I’m also a fan of homegrown pumpkin puree, it makes the best pumpkin pies and of course anything else that has pumpkin in it.